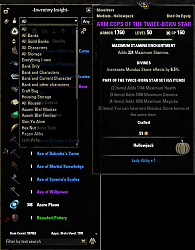 One Inventory to rule them all! Where do I send massive qtys of gold or mats (or not so massive)? - when you right click an itemlink now, you can set the IIfA filter to the item name so you can quickly find it in the list. It also makes IIfA visible. - Bunch of improvements -> FCO Item Saver integration now works properly! Thanks Baertram and AssemblerManiac for making it work. - More fixes on the housing storage. We'll tackle the containers next. - Everything seems to work? - Fixed indexing of trait and style material. Further work in progress. - New setting (Search Set Names) to control how the text filter works. If on, typing in the search filter will also show items with set names (it's additive, so it works by item name OR set name). - New item on the list GUI. Directly above the text search area, there's a checkbox "Filter on Set Name only". When checked, ONLY items from Named Sets (crafted or dropped) will appear in the list, and any text in the search box will be looked for only in set names, not the name of an item. - added sub filter for Recipes - now lets you filter on Food, Blueprint, Praxis, etc. Still need to make it possible to track items OUT of backpack when count becomes zero. Also will be adding timed update to repaint the display if it's not hidden while bulk transfers are in progress. 2.3: Can now display currency across your characters. 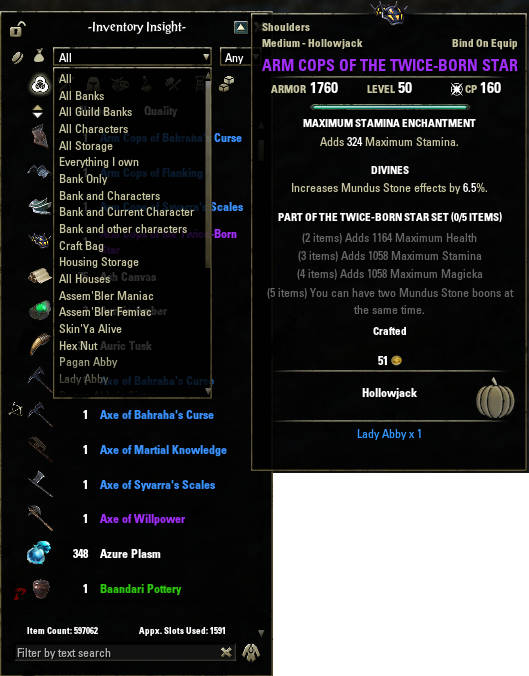 New icons for Ebony and Ashlander Styles. Fixed the style textures again - also, style of worn items will now be displayed correctly! Yay! My search bar is not working atm. Load[ScrollTemplates.xml(945, 25)] (inherits): Error: Unable to find virtual object [ZO_InventorySearchBox]. This sounds like you're in need of updating. That error is from a change ZOS made in some of the base objects. Last edited by nekura : 04/14/19 at 11:53 AM. That would make the addon even more awesome! Thanks for considering this and the fast response. Keep up the good work! Thank you very much for this wonderful addon! It wouldn't be too hard to add an option to remove the close button so the visible setting is only set through settings. Will throw that into wish list. Did the minimize button vanish? I cant seem to find it anymore, nor any option that disabled it? Can you snap a pic and clip it down to the Inv Insight window only? Minimize button is in same place it's always been, but I changed the image to blend in better. It's no longer Teal, it's the same color as the rest of the interface. To Siral & TaxTails: If you hit the close button, it'll remember that state for that scene from then on. Binding to a key is the quickest way to get it back, and it'll remember where you had it open from then on. Last edited by TaxTalis : 04/11/19 at 07:52 AM. Thanks for the addon. It was looking for something like this the other night and yours was the first I downloaded. Awesome Job! When I go into the bank II does not show up. 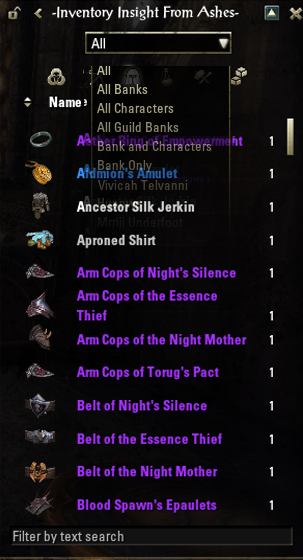 It worked the first night and then work yesterday when I logged in to do all my writs on all my characters. However, later in the evening, It just stopped working when I would go into the bank. It shows up when I do my writs or go to a vendor. Is there a switch I inadvertently shut off? Is there a setting I am missing? Nevermind.... I simply bound a key so I could open it manually. Not sure why it disappeared. Not sure if you're aware of this or not, but the save file doesn't have to change anymore to keep data separate between EU and NA. Yep. But until I can say that about every addon I run, best to keep separate SV folders. You can also wipe it from the Addon Settings under Manage Collected Data. It will re-index the current character and bank after it's wiped. When I saw this, I closed the iifa window, did a /script IIfA:CollectAll(), and re-opened the window, and it was the same. Then did a /reloadui, and it still stayed same. You might need to force IIfA to refresh the window. Filter to something else, then go back to fish. As long as the tooltip is right, the saved data is correct. Didn't mention it in the first post, but I also tried that. I cleared the text filter before doing /script IIfA:CollectAll(), and after re-filtering to fish and still seeing 526, I cleared the text filter again, changed the "All" dropdown to something else, then changed it back to "All", then re-filtered to "fish" in text filter. Still showed 526. The tooltip was correct the entire time, starting from when I first noticed the discrepancy, before I did any steps to correct the main window. ... I just looked in the SV file. The screenshot is from my EU character, but my EU SV file has my NA characters in it as well as my EU char. I keep 2 separate copies of my SavedVariables folder, one for NA and one for EU, and I made a batch file to swap them when I want to swap servers. But I started out the EU folder with copies of the NA SV files, so I wouldn't have to re-do all the settings. I only have 1 character on EU. What's the easiest way to clear the data from the non-existent characters, without deleting the SV file and having to do all my settings over again? Should I just change IIfA_Data["Default"]["@tomtomhotep"]["$AccountWide"]["Data"]["EU"]["DBv3"] to an empty table in the SV file? Yes, you can wipe the database by setting that to an empty table. You can also wipe it from the Addon Settings under Manage Collected Data. It will re-index the current character and bank after it's wiped. IIfA is *supposed* to figure out when characters have been removed and clean up after itself. Not sure what's going on that might be causing that to fail.